The Pod has been developed with input from the Cambridge University Autism Research Centre (ARC) and a special autism school in London. Approximately one in 100 people in the UK experience autism. The Pod induces calm via a relaxing rocking motion and by limiting external sensory stimuli. The Pod is fully insulated and uses a careful dome-shaped design to limit peripheral vision and lower noise levels. The Pod is primarily designed for use in schools. By calming the children they will be more receptive to teaching methods. The Pod has the potential to revolutionise the teaching environment: traditional classroom layouts result in a sensory overload - it offers a calming retreat for children with Autistic Spectrum Disorders (ASD). The Pod results in a more dynamic and flexible learning environment for the benefit of both staff and students. ARK-Angel is designed for use by skiers caught in an avalanche and provides a method for breathing and being located once trapped under the snow. This dual rescue function, coupled with low cost of ownership, positions it uniquely in the off-piste skiing equipment market. Its integration into a rucksack allows the user to carry other complementary safety kit - such as shovel and probe - while the simplicity of the mechanical mechanism makes it suitable for transport by air. The EazyFeed is an automated device for lowering and raising food and water bowls for cats and dogs. It is targeted at the many thousands of elderly and disabled people in the UK who find the task of feeding their pet a challenge. EazyFeed attaches onto a kitchen unit, and at the push of a button, transports a food and water tray from counter height to floor level, and back again. It prevents the user from having to bend down to provide food and water to their pet, yet allows them to retain some independence in caring for the pet. The tray can be easily detached to facilitate cleaning. EazyFeed has been designed for ease of manufacture, with considerable attention paid to the design detail, materials and number of components. The SolarStore is a novel cold storage solution for off-grid locations. It differs from traditional refrigeration systems in that it uses the sun’s energy as a power source. Millions of households throughout the world lack grid electricity and would benefit from the ability to store perishable items without connecting to the grid. This product offers a sustainable and economical means of keeping food cold, preserving its life and reducing waste. The SolarStore refrigerator is powered by a solar collector which concentrates the sun’s electromagnetic radiation to heat a pipe of water. The boiling water then drives an ammonia diffusion absorption refrigeration cycle, cooling the unit. With minimum running cost and low maintenance requirements due to a lack of moving parts, we expect the product to be a success, particularly in developing countries. The ShoulderPad ™ is a hard shoulder safety system designed to encourage users to depart from their vehicles while stationary on the hard shoulder of the motorway. Annually there are over one million breakdowns on the UK motorway system, with up to 250 serious injuries or fatalities whilst stationary on the hard shoulder. 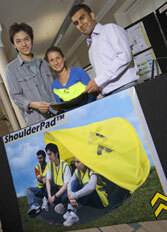 ShoulderPad ™ could help to prevent this by encouraging motorists to leave their car. 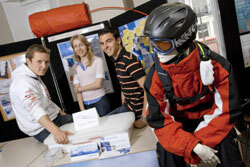 Developed in consultation with the The Highway’s Agency, Survive and the Transport Research Laboratory ShoulderPad ™ is a hard shoulder safety system that aims to create a comfortable environment, away from the dangers of the motorway, giving the driver more incentive to leave their car. It includes equipment required to provide warmth, shelter, visibility and protection from the dangerous motorway environment. 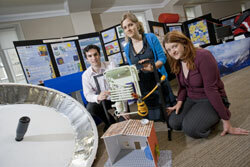 The key element is a pop-up shelter - a temporary base for the motorist, deployable in seconds. More than a billion people do not have adequate access to clean water and this contributes to the extremely high rates of infection and disease in parts of Africa and Asia. The Sanditiser is a slow sand filter that cleans water collected from rivers or other sources and removes slime, sediment, pathogens and microorganisms. It consists of a column of sand and containers for both dirty water and clean, post-filtered water. It works due to a natural bacterial layer that forms on the surface of sand (called Schmutzdecke). This layer attacks bacteria in the water, removing 100% of most pathogens, and leaving the water substantially cleaner. 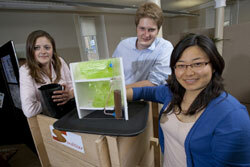 The Sanditiser is a step towards helping to solve the global water problem. It provides an economical solution, unique from competitors due to its flat-packable design (considerably reducing transportation costs), ease of on-site assemble, and development of locally sourceable components, enabling repairs and maintenance. If distributed to the place of need the Sanditiser could save and improve many lives. Both cosmetic and functional upper limb prosthetics are readily available to amputees from their local prosthetics centre. However, none of these are suitable for exercising with effectively. Alternatives do exist in the form of high performance or tailored prosthetics but these are all too often prohibitively expensive. Amputees rely on their local centres to ‘botch something together’ in order to meet any special needs or requirements. Current options include strapping sandbags on to their residual limb as a substitute for weights, or using a paddle-like attachment to go swimming. In both cases, since the loads applied are limited, they perform high repetition exercises that are generally associated with muscle definition instead of development. This design for an affordable prosthetic arm enables trans-radial amputees to use conventional gym equipment. It provides a functional prosthetic limb to allow upper limb amputees to perform a range of exercises in a standard gym, in order to combat muscle wastage on the side of the body with the amputation. It offers a secure interface with gym equipment and transfers forces comfortably for effective exercising.